JAPAN: Principle Power and Mitsui Engineering & Shipbuilding (MES) have signed a collaboration agreement to promote WindFloat projects. "We are very excited about the opportunities our ongoing collaboration with MES can deliver, not only for our work together, but for the floating offshore wind industry in Japan and potentially elsewhere," said Principle Power CEO Joao Metelo. In 2013, MES successfully deployed its own semi-submersible floating offshore foundation, Fukushima Mirai, as part of the 7MW Fukushima Forward demonstration project off Japan. California-based Principle's WindFloat floating foundation technology has been successfully piloted in a 2MW project off Portugal. 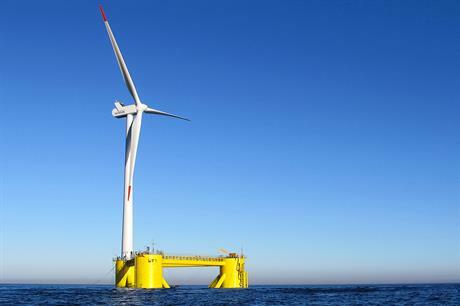 The 25MW Windfloat Atlantic project was approved by Portugal's economy ministry in December. Principle's platform was to be used in the 24MW WindFloat Pacific project off Oregon, but the project dropped from the US Department of Energy's offshore demonstration programme last year. The WindFloat technology has also been tipped for 816MW of early-stage projects off Hawaii being developed by AW Hawaii Wind, part of Alpha Wind Energy.